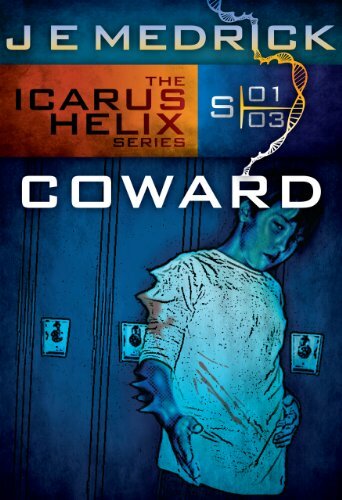 Coward is the third installment of the Icarus Helix series by J.E. Medrick. David West is a normal, nerdy boy. His parents are never home, he is small for his age and he can't get up the courage to get a girlfriend. But when he accidentally absorbs a shower handle, he realizes he might not be so average, after all. His freshman year heads quickly for disaster as he crosses paths with the football team. Now with stress building and nowhere to turn, David's power may be his last road out of mediocrity. At the moment of truth, will he decide it's easier to be brave... or wicked? As I've stated in the past, the Icarus Helix series is about teenagers with special powers with each installment being about a different teenager. Coward - the story of David West - takes the series on a new turn: what happens when a less than popular boy gets a less than desirable power? Will he strive to be a hero or could he be the makings of a villain? The Icarus Helix series is a lot of fun. You can technically read these books out of order, but I recommend reading them in the order they were released. Each book shows the events taking place from a different perspective, and I love the way everything is developing and unveiling. 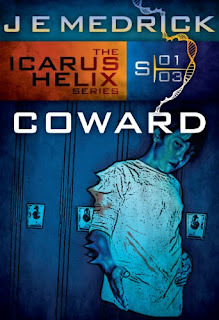 If you are a fan of shows like Heroes or Kyle XY, Icarus Helix would be a great series for you. Hey J! Even though Coward wasn't my favorite of the three, I still very much enjoyed it and love the series.